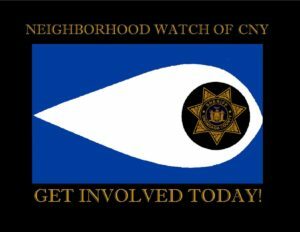 Neighborhood Watch of CNY Needs You. Want to help reduce crime in your community? Form a Watch Group today! Neighborhood Watch is a crime prevention program that enlists the participation of residents, in cooperation with law enforcement, to reduce crime in their neighborhoods. Neighborhood Watch groups take a proactive approach to fighting crime by becoming the extra set of eyes and ears for law enforcement. It is meant to increase surveillance in the community and provides basics skills to all members on preventing crime and reporting suspicious activity or crimes. By forming a watch group, you make it known that you won’t tolerate criminal activity in your community and you make your community less attractive for potential criminals. The program is simple and inexpensive, yet highly effective in the fight against crime. Statistics indicate that communities with active Neighborhood Watch programs show a marked decrease in burglaries and related crimes. If you live in Onondaga County and would like more information or a presentation on joining the neighborhood watch program please contact us at 315-435-3201.